The name of this little Crustacean comes from the Cyclops, the mythical one-eyed giants from the Odyssey, and means: wheel shaped eye There are some "giant species" of Cyclops that catch attention in an aquarium or glass jar with water fleas. They may sit still for quite a while, so the general shape can be seen quite easy with the naked eye. Suddenly they swim away in a 'stroboscopic' movement. It seems these strokes are made with the short, stout antennae, but such is not the case. 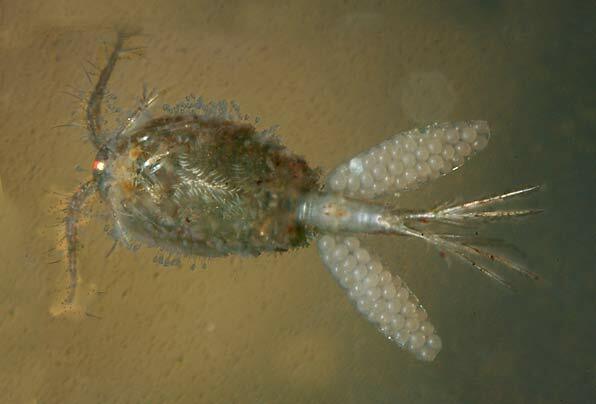 More on the page about Copepods, the group of crustaceans to which Cyclops belongs. The Cyclops on this photo is one of the larger species.